c2 c cent2cent &c. variant Preferred by currencies such as the آسٹریلوی ڈالر, New Zealand, جنوبی افریقی رانڈ cents; the West African CFA centime; and the divisions of the euro. C2 ₡ ColonCosta Rican colón, symbol was also used for the Salvadoran colón. The Salvadoran colón was discontinued in 2001 and it was replaced by the امریکی ڈالر. DKد.ك DinarKکویتی دینار Latin form: K.D. Tongan paʻanga May appear with either one or two bars ( ), both of which currently share the same Unicode space. E€ Euroیورو In addition to the members of the eurozone, the Vatican, San Marino, and Monaco have been granted issuing rights for coinage but not banknotes. 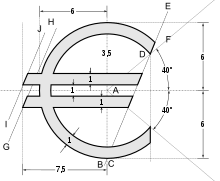 FrFr Franc CoComorian (CF), Congolese (CF, FC), Djiboutian (Fdj/DF), Guinean (FG/GFr) and سویس فرانک (SFr) francs Also F. The character ₣, representing an F with a double bar, proposed as a symbol for the French Franc by Édouard Balladur in 1988 was never adopted, it is represented by a ligature Fr in some fonts. q q qindarkeAlbanian qindarkë A centesimal division of the lek. رینمنبی (元/圆) Used with one and two crossbars. ^ ا ب Forexforums.com. "Currency symbol finder." Accessed 24 Feb 2011.